B-cell lymphoma-extra large (Bcl-xL), encoded by the BCL2-like 1 gene, is a transmembrane molecule in the mitochondria. It is a member of the Bcl-2 family of proteins, and acts as an anti-apoptotic protein by preventing the release of mitochondrial contents such as cytochrome c, which leads to caspase activation and ultimately, programmed cell death. It is a well-established concept in the field of apoptosis that relative amounts of pro- and anti-survival Bcl-2 family of proteins determine whether the cell will undergo cell death; if more Bcl-xL is present, then pores are non-permeable to pro-apoptotic molecules and the cell survives. However, if Bax and Bak become activated, and Bcl-xL is sequestered away by gatekeeper BH3-only factors (e.g. Bim) causing a pore to form, cytochrome c is released leading to initiation of caspase cascade and apoptotic events. While the exact signaling pathway of Bcl-xL is still not known, it is believed that Bcl-XL differs highly from Bcl-2 in their mechanism of inducing apoptosis. Bcl-xL is about ten times more functional than Bcl-2 when induced by the chemotherapy drug, Doxorubicin and can specifically bind to cytochrome C residues, preventing apoptosis. It can also prevent the formation of Apaf-1 and Caspase 9 complex by acting directly upon Apaf-1 rather than Caspase 9, as shown in nematode homologs. Bcl-xL dysfunction in mice can cause ineffective production of red blood cells, severe anemia, hemolysis, and death. This protein has also been shown as a requirement for heme production and in erythroid lineage, Bcl-xL is a major survival factor responsible for an estimated half of the total survival "signal" proerythroblasts must receive in order to survive and become red cells. Bcl-xL promoter contains GATA-1 and Stat5 sites. This protein accumulates throughout the differentiation, ensuring the survival of erythroid progenitors. Because iron metabolism and incorporation into hemoglobin occurs inside the mitochondria, Bcl-xL was suggested to play additional roles in regulating this process in erythrocytes which could lead to a role in polycythemia vera, a disease where there is an overproduction of erythrocytes. Similar to Bcl-2, Bcl-xL has been implicated in the survival of cancer cells by inhibiting the function of p53, a tumor suppressor. In cancerous mouse cells, those which contained Bcl-xL were able to survive while those that only expressed p53 died in a small period of time. 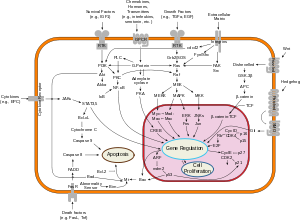 Other Bcl-2 proteins include Bcl-2, Bcl-w, Bcl-xs, and Mcl-1. ^ Korsmeyer, Stanley J. (March 1995). "Regulators of Cell Death". Trends in Genetics. 11 (3): 101–105. doi:10.1016/S0168-9525(00)89010-1. Retrieved 5 November 2016. ^ Finucane, Deborah M.; et al. (January 22, 1999). "Bax-induced Caspase Activation and Apoptosis via Cytochromec Release from Mitochondria Is Inhibitable by Bcl-xL". The Journal of Biological Chemistry. 274: 2225–2233. doi:10.1074/jbc.274.4.2225. ^ Fiebig, Aline A.; et al. (August 23, 2006). "Bcl-XL is qualitatively different from and ten times more effective than Bcl-2 when expressed in a breast cancer cell line". BMC Cancer. 6 (213). doi:10.1186/1471-2407-6-213. PMC 1560389. PMID 16928273. ^ Bertini, Ivano; et al. (April 18, 2011). "The Anti-Apoptotic Bcl-xL Protein, a New Piece in the Puzzle of Cytochrome C Interactome". PLOS One. 6: e18329. doi:10.1371/journal.pone.0018329. ^ Hu, Yuanming (February 21, 1998). "Bcl-XL interacts with Apaf-1 and inhibits Apaf-1-dependent caspase-9 activation". Proceedings of the National Academy of Sciences of the United States of America. 95 (8): 4386–4391. doi:10.1073/pnas.95.8.4386. PMC 22498. PMID 9539746. Retrieved 20 November 2016. ^ Rhodes, Melissa M.; et al. (May 17, 2005). "Bcl-xL prevents apoptosis of late-stage erythroblasts but does not mediate the antiapoptotic effect of erythropoietin". Blood. 106 (5): 1857–1863. doi:10.1182/blood-2004-11-4344. PMC 1895223. PMID 15899920. ^ M, Silva; et al. (February 26, 1998). "Expression of Bcl-x in erythroid precursors from patients with polycythemia vera". New England Journal of Medicine. 338 (9): 564–571. doi:10.1056/NEJM199802263380902. PMID 9475763. ^ AF, Schott (1995). "Bcl-XL protects cancer cells from p53-mediated apoptosis". Oncogene. 11 (7): 1389–1394. PMID 7478561. This page was last edited on 5 February 2019, at 02:36 (UTC).